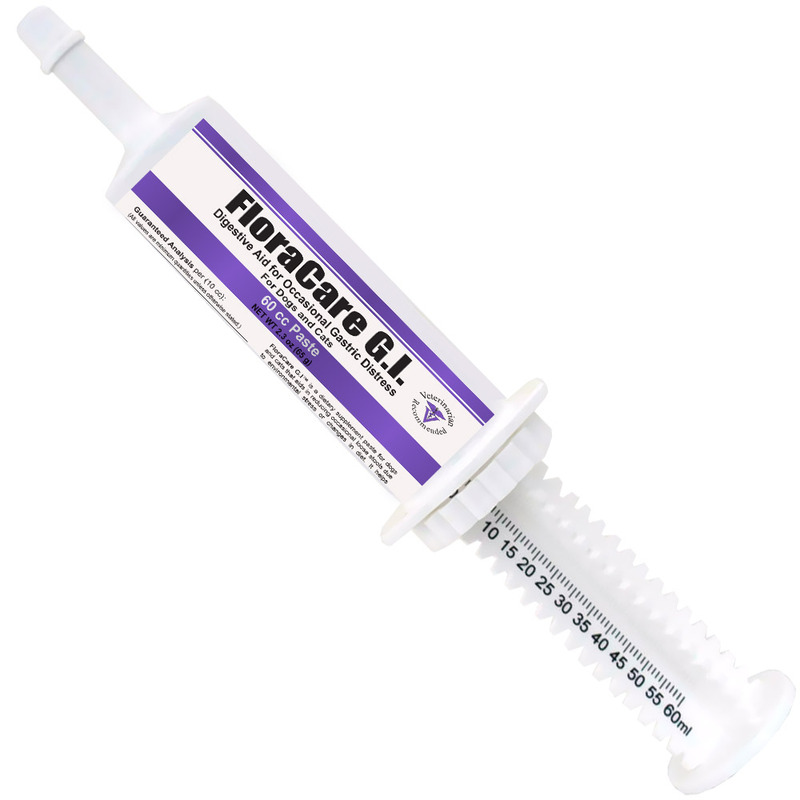 FloraCare G.I. is a probiotic supplement paste for dogs and cats that aids in reducing occasional loose stools due to environmental stress or changes in diet. Formerly RapidCare G.I., this supplement uses the same great formula to help maintain a healthy intestinal tract and helps supports proper digestion and bowel health. There are many reasons your dog or cat may experience occasional gastric distress. Loose stools can be the effects of overeating, sensitivity to certain foods, or even garbage gut. Gastrointestinal upset can also be caused by your pet's age, from stress associated with traveling or other changes, use of antibiotics, or in the case of very young pets, weaning. The unique mix of ingredients and probiotics is targeted at supporting the health and normal function of the G.I. tract. Pantothenic Acid also is known as Vitamin B5 is necessary to synthesize CoA, which metabolizes proteins, fats, and carbohydrates from the food your pet eats so that their bodies can use them for energy and rebuilding tissue, muscles, and organs. This acid helps maintain the acid-base homeostasis in the G.I. tract when the temporary gastric upset occurs. Included probiotics work to help your pet's gastrointestinal tract have the proper balance of healthy microorganisms to promote inner well being. This special formulation contains 4 strains of live (viable) bacteria cultures that support healthy digestion and appetite. 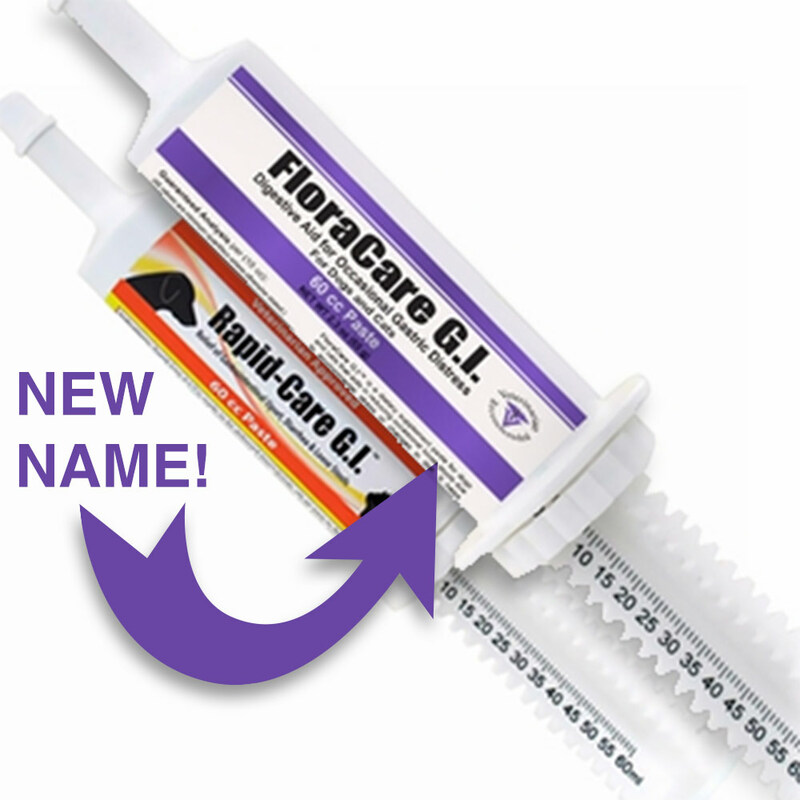 Keeping an easy to use a tube of FloraCare G.I. handy can provide immediate response to the negative effects of occasional gastrointestinal upset. FloraCare G.I. is administered from a tube and comes in a tasty paste form that pets love. It is recommended to feed FloraCare G.I. paste to your pet at the first signs of gastric upset. Ingredients: Yeast Extract, Primary Dried Yeast, Vegetable Oil, Dried Lactobacillus Acidophilus Fermentation Product, Dried Enterococcus Faecium Fermentation Product, Dried Lactobacillus Casei Fermentation Product, Dried Lactobacillus Plantarum Fermentation Product, Dried Aspergillus Niger Fermentation Extract, Dried Aspergillus Oryzae Fermentation Extract, Dried Bacillus Subtilis Fermentation Extract, D-Calcium Pantothenate, Pyridoxine Hydrochloride, and Riboflavin Supplement. Squeeze measured amount onto pet's food or pet's bowl. This product is intended for intermittent or supplemental feeding only.